Either Katla in Iceland is about to blow or it isn’t. It is a subglacial volcano giving off five to ten times more CO2 than vulcanologists expected. This has some experts spooked, though others are saying it’s not that unusual. Icelandic and British volcanologists have detected Katla— Icelandic for “kettle” or “boiler” — is emitting carbon dioxide on a huge scale which suggests magma chambers are filling up fast. According to the Sunday Times, the scientists believe it could be an indicator that an eruption could be brewing which would overshadow the eruption of the Eyjafjallajokull volcano in 2010. The emissions are in the order of 12 to 24 kilotons a day which means 4 to 8 megatons a year. That’s the same output as an extra 1 – 2 million cars on the road each year. UPDATE #2 from TonyfromOz This volcano is equivalent to 50 new coal plants! A new UltraSuperCritical coal fired power plant (a HELE plant) with two 1200MW units (so, a Nameplate of 2400MW) will emit around 12 million tonnes of CO2 each year, so taking that upper limit for Volcanic CO2 emissions of 600 Million tonnes per year, then the volcanic emissions alone equal around FIFTY of those plants each year. Shutting down one coal fired power plant is akin to a f@rt in a cyclone. We discovered that Katla volcano in Iceland is a globally important source of atmospheric carbon dioxide (CO2) in spite of being previously assumed to be a minor gas emitter. Volcanoes are a key natural source of atmospheric CO2 but estimates of the total global amount of CO2 that volcanoes emit are based on only a small number of active volcanoes. Very few volcanoes which are covered by glacial ice have been measured for gas emissions, probably because they tend to be difficult to access and often do not have obvious degassing vents. Through high‐precision airborne measurements and atmospheric dispersion modelling, we show that Katla, a highly hazardous subglacial volcano which last erupted 100 years ago, is one of the largest volcanic sources of CO2 on Earth, releasing up to 5% of total global volcanic emissions. This is significant in a context of a growing awareness that natural CO2 sources have to be more accurately quantified in climate assessments and we recommend urgent investigations of other subglacial volcanoes world‐wide. Katla is one of the largest volcanic sources of CO2 on the planet, contributing up to 4% of global emissions from non‐erupting volcanoes. I wondered how much CO2 volcanoes give off in the big scheme (doesn’t everyone?). But total estimates of emissions of CO2 from volcanoes vary a lot: The United States Geological Survey (USGS), estimates 200 million tons, the British Geological Survey estimates volcanoes emit 300 million tonnes CO2and Italian National Institute of Geophysics and Volcanology estimates 600 million tons. For perspective, if those numbers are remotely correct, then that’s about the same as Australia’s total emissions per annum (which means “not much”.) Total human emissions globally are around 10 Gigatons per annum. The silent, silvery plumes which are currently winding their way skyward above the 150 or so active volcanoes on our planet also carry with them the bulk of its carbon dioxide. Their coughing fits might catch the eye — but in between tantrums, the steady breathing of volcanoes quietly sheds upwards of a quarter of a billion tons of CO2every year. We think. Scientists’ best estimates, however, are based on an assumption. It might surprise you to learn that, well into the new century, of the 150 smokers I mentioned, almost 80 percent are still as mysterious, in terms of the quantity of CO2 they emit, as they were a generation ago: We’ve only actually measured 33. Without the water, though, it’s a different story. The new poster-child of planetary degassing is diffuse CO2 — invisible emanations which can occur across vast areas surrounding the main vents of a volcano, rising through the bulk of the mountains. What we don’t know about volcanoes? — Hilliers in 2007 estimated about 40,000 underwater volcanoes. Despite volcanoes being a lot bigger than spotted quolls, we still can’t even count them. People are constantly discovering new volcanoes, like a 3,000m one off Indonesia that no one realized was there til 2010. It turns out the second largest volcano in the solar system is apparently not on Io, but 1,000 miles east of Japan. It’s the size of the British Isles, but who knew? A few months ago a team found 91 new volcanoes under Antarctica. …we know more about the moon than the bottom of the Mariana, and it’s only 11km “away”. Climate scientists must be hoping for a decent eruption. When the Earth doesn’t warm as predicted one good volcano could provide great cover for failing models. Look for the Blame the Volcano Game, coming to your public broadcaster soon. With the imminent explosion, as Mother Earth fights back at Tim Blairs blog where rhhardin says – Look for MAGMA hat sales. Hillier, J. K., and A. B. Watts (2007), Global distribution of seamounts from ship-track bathymetry data, Geophys. Res. Lett., 34, L13304, doi:10.1029/2007GL029874. Interesting, indeed fascinating, just how much we don’t know about our own planet. BTW Jo, I think you just been attacked by predictive text…it’s Mariana (Trench), not Marinara (sauce). Dang, beat me to it. I was going to say, that has to be the quote of the day (at least). At least the bottom of the Marinara has been explored quite often. The Italians should be good at exploring the Marinara. I drove teenage friends and my son to Queensland many years ago for school holidays and as son was learning to drive we took the back roads in many places including from Lismore to the Gold Coast via Nimbin NSW, the marijuana capital of Oz. And the jokes commenced about stopping for hash cakes and so on. That evening sitting in an up market Italian Pizza Restaurant in Surfers Paradise I requested “Marijuana” pizza. Stunned silence, laughter from the boys and a smirk on the waiter’s face and I got the message, “Marinara please”. The Challenger Deep is the deepest part of the Mariana Trench at a measured (approximate) 35,755 feet down, roughly 11,918.3 meters. How do you build a submersible strong enough to withstand the pressure? Marinara sauce sounds like the better deal. To withstand pressure of 1125 atmospheres, this pilot capsule had to be a sphere of steel with walls 65mm thick. For comparison, destroyer ships in WW2 had 300mm of steel armor. I’m more impressed that an entirely new composite material was invented to make the fuselage of Cameron’s Deepsea Challenger. Stop me if I’m remembering my physics wrong but if the pressure is against a sphere all the resultant force is compression within the wall of the sphere and that’s the way you get the most pressure resistant hull for the material and thickness. But even a small viewport has got to be a major structural problem. The other problem with diving so deep is that there is no such thing as a minor leak. The tiniest opening, just an invisible flaw in the hatch or a place where controls go through the hull will let water through so fast that you fill up in seconds and the stream of water cuts like a scalpel. I would be so nervous I couldn’t work. And I wouldn’t have known anything about the Mariana Trench except I started writing this sci fi thing in which my alien starship captain has to get rid of several automobiles and he brings them aboard ship to get them out of sight and then dumps them in the Challenger Deep. I had to go researching to find the deepest place I could. Otherwise the Mariana Trench was just a name I read one time or another. Why he has to get rid of them and how he gets them aboard is left to you to read the book. Just remember that in fiction, anything is possible. Does this CO2 originate as CO2, or does it come out as carbon or some other compound which joins with atmospheric oxygen? Volcanic temp / pressure effects on mineral carbonates? I would think that any major volcanic erruption would be a significant source of Co2. In the 1,100 year recorded history of this volcano it has had a major erruption about every 95 years until the last major in 1918. So based on past history it’s way over due. I tend to agree Peter, the rise in CO2 has been steady so the 40% increase over the past two centuries is clearly due to the gas being liberated from the deep oceans. Tourists and other people were prohibited from approaching the crater within a 2 km (1.2 miles) radius. Reminds me of our visit to Tanna and standing on the edge of the crater of Mt Yasur. It erupted several times and the ground moved. The guide assured us that they were able to judge where the airborne leave blob would land. A month later we read about a Frenchman who was hit and killed by a lump of that lava. The size of the molten lava field had the equivalent content of several hundred iron making Blast Furnaces. It put human CO2 emissions into perspective. It put Carbon mitigation programmes into perspective. Well at least a little over due. Well it makes the seed vault in the arctic more relevant if a mini ice age is coming. If many crops are GMO and don’t re-seed, then guess who controls the food? The UN. Control the food, control the people. Access to that seed vault needs to be open to all nations without restriction if needed. We discovered that Katla volcano in Iceland is a globally important source of atmospheric carbon dioxide (CO2) in spite of being previously assumed to be a minor gas emitter. So, ‘settled’ politics is revealed yet again to be the important source of flatulent climatism. I don’t understand why they can’t force these volcanoes to utilise renewable energy and reduce their CO2 emissions. I mean, we can change the climate by installing solar panels and windmills, surely we can apply the same technology to volcanoes? Yes. And as soon as you’ve done that, please harness the lightning. That could be very, very frightening! Just TAX it! And send the bill to Gaia. Actually, when the likes of Flannery call the Earth an intelligence or such, isn’t this an indicator that the Earth condones CO2? It’s a message to humans that CO2 is a lifegiving product and is a blessing for life on Earth and here we are going against Mother Nature herself (typical old, white, men – politicians, globalists, university professors, bankers, financiers and media moguls). Several years ago. the US Forest Service closed a campground in the area because there was so much CO2 coming up it was killing the trees! They were afraid some campers might not wake up in the morning! There are soda springs throughout the world, and CO2 vents under the seas. We really have a poor understanding of the amount of CO2 emitted from the ground and especially under the oceans. It happens in Africa. 1700 killed in one night. Goes to show that every little bit (of human co2 emissions mitigation efforts) does not count, nor does it matter. If I recall correctly, Bob Carter once mentioned; all the sacrifices, the trading in of SUVs for EVs, taking public transport, paying ridiculous utility costs, and so forth and so forth, are wiped out by one forest fire. Annual human emissions are around 3.75% (3.8% rounded up or 4% with even more extreme rounding) of total annual emissions of our favourite life-preserving gas anyway. Why are we even trying to reduce them? With all the `estimating’ going on, they’re surely fair and square in the error margins. Not worth the worry. Life preserving gas, yer right Sophocles. themselves from, empirica, science-based investigation of Naychur. Only 33 volcanoes have actually been monitored? That is amazing. I am sure they constantly monitor Mauna Loa for CO2, but what about Kilauea or the other active and inactive volcanoes in Hawaii? How about Yellowstone or Long Valley? I would not be surprised to find out that supposedly extinct volcanoes are still off gassing CO2, but why check? I wonder how many volcanoes are trying to make carbonated water under the Arctic ice cap? The more facts we learn, the more we realize that there is some other reason behind the AGW scam than saving the planet. How many billions should the icelanders pay to the voodoo-scientific trust of the IPCC based upon the Paris agreement ? Why did the victim lay the complaint herself? He was so successful at destroying his own career in his arrant arrogance, he didn’t need any help from sceptics nor alleged right wing think tanks. Does he really think our memories are so short? Insulting little man. There have been a number of studies to indicate there is an inverse correlation between solar activity and volcanic activity. The reason is unclear but a few have suggested it has something to do with the magnetic field of the sun interacting with the earth’s magnetic field. If the inverse correlation is real then it’s no surprise we’ve seen an increase in frequency of volcanic activity of late. If the solar activity continues to decline we can expect an increase in volcanic activity, as well as a cooling of the earth as proposed by other studies. I suppose we’ll know more if any of this is true in say a decade or so. As for the concern about the amount of CO2 in our atmosphere by global warming alarmists, perhaps they can now turn their attention to volcanoes and forget the lies they keep spewing out about mankind being the main or only culprit. Of course that would be asking too much of them since they have about the same amount of true scientific intelligence as that of a rodent. I’ll play devil’s advocate, this from Skeptical Science. I’m sceptical too. I’m more in the camp that increases in CO2 in our atmosphere is mainly due to the long term warming of the planet since the major ice age leading to more CO2 being released from the oceans. Me too, as instructed by TdeF on these pages. However, volcanic and earthquake activity do appear to be related to the sun’s lack of activity. More research is needed. Check in at Suspicious0bservers.org. There does, indeed, seem to be a link between heightened Solar Wind from coronal holes and earthquake/tectonic activity. https://suspicious0bservers.org/ Look for the daily news for new earthquakes etc. The following is a link to one of many of Armstrong’s articles. He covers many other topics and in all cases uses a computer program he wrote called Socrates to make predictions. I’ve been following his forecasts for a number of years and his hit ratio is very high although not perfect. His long term big picture forecasts on the financial markets and geopolitical events have been near perfect. Skepticalscience is mistaken, so what’s new? They regard and treat the atmosphere as a static container with a static unvarying interchange of CO2 so that the `surplus’ accumulates in the atmosphere, filling it up, and ascribing it to human output, rather than it being the dynamic system it is as promoted by Ed Berry. This talk by Willie Soon has info about the relationship between solar minima and earthquakes. The atmosphere is currently dangerously low in CO2, not far above the 100-150ppm required for plants to live. Good to see this topped up. The media in England has been creating anxiety around an impending eruption of Katla volcano, despite redactions from numerous news outlets in Iceland and expert opinions to the contrary. It isn’t, in other words, imminent that Katla volcano will erupt. Ilyinskaya’s report on the increase of gases is a part of a larger research project into volcanic gases and aerosols. Previously, Ilyinskaya, who harshly criticized the British media’s reporting on the potential eruption, installed gas monitoring systems at Hekla volcano, which “now forms part of the permanent monitoring network of Hekla operated by the Icelandic Met Office (Vedurstofa Islands).” She hopes to see long-term monitoring at Katla as well. “Giant Iceland Volcano About to Erupt,” the Daily Mail wrote; “Scientists Warn of Massive Eruption,” the Standard trumpeted before taken down the inflated article. The same blatantly exaggerated reports followed at outlets like the Sunday Express, the Daily Mirror, and the Sun, some of which posited that the eruption would be as violent as the 2010 Eyjafjallajökull eruption, which famously stopped air traffic in Europe. The Evening Standard set up a live feed, which is still in progress, though now it’s being used to monitor the aggravated volcanologist’s clarifications. Many of the exaggerated reports over the past week have been a result of the Sunday Times’ reporting, which wove a narrative in which an eruption was imminent, despite specialists comments that it’s unclear when (and to what extent) Katla will erupt. Guide to Iceland Now previously reported that the likelihood of an eruption was minimal, in an interview with noted professor Jónas Elíasson. Ilyinskaya has stated that the reports are grossly exaggerated and that the papers twisted her words to suit their own purposes. Was there any project for water temperature gradient recording around those areas, ie – the “warming” claimed by Svalbard Seed Storage people as the source of their problems ? Would it be possible to say if the heat comes up from the ocean bottom (volcanic activity) or down from the atmosphere above it? The Establishment news papers are turning into leftist barking dogs…..this is by design…the level of intellect required in the Leftist utopia is very low..which is what you want thier slaves to be…. Update added to the post. Thanks Pat~! “A man has died after falling into the crater lake at Mount Ruapehu” reported RadioNZ on Saturday 22nd September. One hell of an unfortunate and sad sacrifice to the volcano fire gods & goddesses yet it did placate / cool down the mountain, and the snow returned, and it was freezing, and it was cold, and snowing, and it was good. What was he doing standing on the edge of the crater lake at the top of one of our most unreliable volcanoes? Maybe the Inca weren’t wrong, after all, or God blinked. Or some people take unnecessary risks…. Maybe the rock strata contains CO2 sequestered by ancient civilisations of pre-recorded history..For example, to appease one of their gods they may have noticed/observed for the first time that the gods are particularly fond of CO2 and not simply the act of performing a fire sacrifice. And so instead of using fires for rituals, they could appease the gods any time by simply turning on the tap and releasing some of the sequestered CO2? People used to swim in it in the 1940s? I think. The many times I went up there I wouldnt put my foot in it..I think the pH is well in the plus area. Yup the temp does go up and down. I’ve been up there only twice. Both times the “earth moved” so I returned to parts a possible lahar would likely miss pretty quickly. There’s a planet, very close, of which the great bulk is largely unexplored. In some future age of investigation and observation it may be possible to learn more about this colossal object, its volatile interior, its deep hydrosphere as well as its environs and interactions in space. The planet’s called Earth, but it may as well be called Fred since the temple priests overthrew the scientists. People are constantly discovering new volcanoes, like a 3,000m one off Indonesia that no one realized was there til 2010. All we need to do is send out the American submarine fleet on a sea-mount hunting exercise. They should be pretty good at finding new submarine volcanoes. There was the USS San Francisco (de-comissioned in 2016) https://www.navy.mil/submit/display.asp?story_id=18257 which was en route from Guam to visit Sydney in 2005, it discovered, or rather re-discovered, a dormant submarine volcano by hitting it bow first at a depth of around 150m at `flank speed’ (== full underwater speed). This slumbering sea mount was minding it’s own business by not appearing on the chart in use for navigation, when this inconsiderate underwater warship ran into it. Other charts on the sub were apparently aware of a `near-by navigational hazard’ somewhere around the location, which was possibly the snoozing sea-mount, as detailed here: https://www.cbsnews.com/news/whos-to-blame-for-sub-accident/ but they weren’t asked. Just as well it (the volcano) didn’t wake up. The submarine managed to return to base, although, tragically, one crew member died in the collision. Hope your new location is up to your expectations. good to see TonyfromOz posting. This summer the Northern Hemisphere has been sweltering in unusually high temperatures. It’s been hot from the Arctic to Africa. This has led to increased deaths, notably in Canada, and more wildfires, even in Lancashire and in Sweden. Can we say that this heatwave – and the extreme drought in Australia – is a result of climate change? Or is just part of the variable weather patterns we have on our planet? Roland Pease gets answers to these questions from the world’s leading climate and weather scientists. He picks apart the influences of the jet stream, the El Nina and the Atlantic decadal oscillation from that of global warming. NEAR THE START, BBC’S ROLAND PEASE SAYS HE’LL BE INVESTIGATING CONNECTION BETWEEN GLOBAL WARMING AND THE WEIRD WEATHER IN THE NEXT TWO “DISCOVERY” PROGRAMS AS WELL. SECOND ONE IS ONLINE, BUT NO AUDIO AS YET. ENDS WITH ROLAND PEASE PREVIEWING THE NEXT PROG CENTRING AROUND THE ARCTIC BY THE SOUNDS OF IT. ROLAND PEASE: MICHAEL MANN SAYS WE SHOULD SMARTEN UP TO THE CONNECTION BETWEEN GLOBAL WARMING AND CHANGING WEATHER. MANN ENDS THE PROGRAM. IT’S IRRELEVANT TO ASK DID CLIMATE CHANGE CAUSE THIS STORM TO FORM. IT’S A QUESTION YOU CAN NEVER REALLY ANSWER. THE BETTER QUESTION TO ASK IS, ONCE THIS STORM BEGAN TO FORM, WAS IT INTENSIFIED BY CLIMATE CHANGE, & WE NOW HAVE GREAT CONFIDENCE THAT, IN MANY WAYS, THE ANSWER IS YES. end. At least this Icelandic volcano has a name which is easy to pronounce. Not like the last one in the news which caused so many problems, Eyjafjallajökull, and try pronouncing that. I even went to a couple of audio sites and tried listening to how it was pronounced, and even they varied. It was a comedy listening to the news reports and how they tried to pronounce it, and you could just see them trying to read it off the autocue, especially the Commercial channels with the two news readers. Even the ABC resorted to saying that volcano in Iceland. I think it’s: I’m off down to the local. From the recent WUWT Katla discussion: “Eyjafjallajokull … is pronounced (very quickly) as “EYE-ya-fee-AHT-la-YIOK-ət’l” . I wonder if the name of the (other) volcano in Iceland is what put the comment into moderation. “The radical threat posed by global warming poses a profound challenge to every vocation. At the core of every profession, from engineering to accountancy to law to journalism, is the idea of providing expertise in service to the public good. Professionals must act ethically, in accordance with relevant codes and standards. But with the whole system under challenge from the possible collapse of the natural systems that support life on earth, are these ethics be sufficient? Is it possible to be an ethical professional while also providing advice that supports fossil fuel companies? How are professional standards and codes of ethics shifting in response to the catastrophic threat posed by climate change? How have certain professionals been implicated in perpetuating and legitimising environmentally destructive acts? This outstanding panel will consider these and other profound questions facing all professionals in the age of global warming. Take heart though; a dear little singing bird is flitting around in the ghaf tree outside the window. It is singing its heart out in this healthy specimen of the UAE national tree, growing where there was bare sand not many years ago. There is now a little oasis of green which didn’t exist until recently…a little miracle among many, thanks to electricity and water. The wild life moves in once this happens, unfortunately including ants! It must be a Carbon Tree, the tree of saving the planet by absorbing CO2. Quick Annie, please email all universities for distribution to students, nature works in mysterious ways. The challenge is profound, the questions are profound…that’s a lot of profound. Think how ethical, outstanding and profound these self-satisfied kidz would be if they used clear definitions and precise terms, just like grown-ups have to do all the time. One should expect the Italians to go high. The last group went low and ended up in court and jail. He said Ms Guthrie showed no interest in journalism or content. is Faine suggesting Guthrie should have have interfered in the content/journalism? doubt it, but that was my gripe. she did nothing about the failure of journos to abide by the requirements of the ABC charter. POSTSCRIPT: A NUMBER OF PEOPLE I’VE SPOKEN TO THINK MALCOLM TURNBULL WILL REPLACE GUTHRIE!!! DOUBLING HIS SALARY IN THE PROCESS??? TELL ME THIS WON’T HAPPEN. The silent, silvery plumes which are currently winding their way skyward above the 150 or so active volcanoes on our planet also carry with them the bulk of its carbon dioxide. Their coughing fits might catch the eye — but in between tantrums, the steady breathing of volcanoes quietly sheds upwards of a quarter of a billion tons of CO2 every year. A quarter of a billion tonnes of that deadly “Carbon” aka CO2 per year from Volcanoes! Not much on this planet can match that for a natural source of ‘Carbon”. Although there are a few natural occurring species and life forms around that can and do match those CO2 emmission figures. In one case each individual of the species BREATHES OUT around 0.9 kgs per day of CO2 or “Carbon” as it is known as amongst the green climate alarmist cognoscenti. Thats about 330 kgs of that deadly “Carbon” each year breathed out by each individual of the species.. Lets round off those numbers and call it a third of tonne of “Carbon ” emmitted each year by each individual of the species. Now by a rough count there are now about 7.6 billion individuals in this particular species. A third of a tonne of Carbon emmitted by each of these 7.6 billion individuals in the species and we have this species alone and all by itself, emmitting about 2.5 billion tonnes of CO2 aka Carbon dioxide aka “Carbon” per year. Or around 10 times as much CO2 as it is estimated that all the world’s volcanoes emit each year if the claims of those scientists quoted above are correct.! Oh dear! Can we learn something from this. I do wish scientists would do bit of simple reading and research before they open their yawning traps and put both feet into it when they make all sorts of unproveable and ill thought out claims and make a big song and dance about it all! The species mentioned, Homo sapiens, does have a lot to answer for when they breathe out each year ten times more CO2 that deadly “Carbon” of the climate alarmists than does the world’s volcanoes. However if the greens , climate alarmists. climate activists, assorted politicians , climate modellers and assorted climate scientists , plus, plus, all collectively stopped breathing permanently we can see from the figures above our species could then lessen our impact on this planet by a considerable margin and thereby counteract the effect of the volcanoes and their increased emmissions if those scientists quoted above are correct in their claims. Workers in the fossil fuel industry must be assured a “decent future” even as mines and plants are forced to close, according to a leaked draft UN declaration. At a conference in Oxford on Monday, experts said planning was key to ease the pain for mining communities. At the moment, mining companies continue to sponsor university courses for new workers to enter the industry. Yet for all the mine closures, Poland still overwhelmingly relies on coal, the cheapest and dirtiest of fossil fuels, for energy. In 2015, 81% of its electricity came from coal – and the industry has a strong influence on policy. Many environmentalists are gritting their teeth over the choice of a coal heartland to hold key climate talks. Luberta maintains a grave expression throughout our discussion on climate policy, but lights up when asked about his personal relationship to coal. Above all, he loves working with nature, he says. According to Euracoal, the sector employs around 100,000 Poles. At the same time, one of his three priorities for Cop24 is the “just transition”: code for protecting fossil fuel workers from the disruptive force of clean energy. On Monday, Climate Home News published a draft declaration from the Polish Cop24 presidency that called for workers to be ensured a “decent future”. Myles Allen, a lead coordinating author of the summary for policymakers, said it was “offensive” to suggest scientists did what governments told them. “It is painted as governments bullying scientists. It is demeaning to the governments, because it suggests they act unethically, and it is demeaning to the scientists, because it suggests we can be bullied,” he told Climate Home News on the sidelines of a conference in Oxford. “Governments are asking for clarifications and pointing out where there is scope for misunderstanding of what has been said… It is actually a constructive process,” he said. Others rebutted the story on Twitter. “Drafts & comments will be publicly available so these claims will be testable. I doubt there’s downplaying due to political pressure,” wrote Richard Betts, professor of climate impacts at the University of Exeter and Met Office Hadley Centre who was a reviewer on the early drafts. In a statement, the IPCC said the report authors had to address more than 42,000 comments received over three review periods, and incorporate new literature up to the 15 May cut-off date. “All IPCC reports go through several drafts and reviews. It is completely normal for the text of the main report and the Summary for Policymakers to evolve over this process,” the statement said. I’m wondering if the volcanoes in Antarctica have anything to do with the claim that climate change is responsible for the disappearing plant life on east Antarctica or is your ABC just blowing hot air . And speaking of Co2 they are also reporting that AGL just coped a $3mil fine for excess emissions in Victoriastan. Serves AGL right, after all they are transitioning to unreliables and the CFMEU is investing in them too. And carbon dioxide pollution is not acceptable in what was the garden state. From the Oz “Victoria’s largest energy supplier, AGL, has been fined almost $3 million for failing to provide a record of its energy efficiency obligations to the regulator. I might have stuffed that up but am sure they said emissions . No attempt to quantify the amount leaking into the atmosphere in the decades before an eruption or undersea volcanoes. The problem we have is convincing anyone that most of the CO2 is being liberated from the warmer oceans, but the CSIRO is convinced its all down to industrialisation. No need to convince people where it comes from…. ….just show them that it is not a cause global warming, but a result of the warming. Show the graph of CO2 concentration increase lagging behind the temperature increase. Katla is quiet. Just a few weak shallow tremors round the 9X14Km caldera which moves ‘cos there’s nearly 1Km depth of ice over it. Happens all the time. There is no seismic activity which would suggest to me the magma chamber is filling up. If it does we’ll see the seismic swarm soon enough! You mean wasn’t VW diesels after all? I remember when Mt Pinotubo (eruption date?) was blamed for ever weather event usually cold snaps. Probably not but when it did blow in 169AD it was the biggest (volcanic) bang in history in the last 2000 years. Mark M – Diesels put out far more real pollutants as in carbon particulates (not CO2) than petrol vehicles. So that article is probably true (The study focuses on emissions of nitrogen oxides, or NOx, ). “Mark M – Diesels put out far more real pollutants as in carbon particulates (not CO2) than petrol vehicles. Perhaps so, but, it is not the end of the world. Diesel engines typically consume less gallons of fuel than gasoline engines per miles traveled or work performed. Particularly if they are force feed air via turbocharger. The movement against diesel engines stems from the fact that they are a better higher MPG alternative for many people than hybrids or EVs. They also don’t require becoming golf carts in terms of size and weight to obtain that improved mpg performance. Greens hate that people buy diesel vehicles instead of their proscribed little green approved vehicles. They want them off the roads. CARB set an impossible and unnecessarily high standard for diesels to obtain on purpose. This has lead to the cheating. I haven’t had recent Diesel vehicle experience here in the states but when I did the stuff offered to the public wasn’t well engineered, didn’t have heavy enough engine blocks, had fuel injector and pump problems, and was generally not up to the standard of commercial diesel powered trucks, farm equipment, etc. And the one I had belched smoke unmercifully if I was climbing a grade with my foot down hard. And it takes a lot of technology to clean that up. Mercedes Benz and Pugot had diesels that were better quality but you paid a fortune for them. And that’s the problem. Diesel is a just plain more expensive engine to get right and once you have it right, more expensive to manufacture. Engine blocks and heads alone need to be heavier to withstand the constant hammering of combustion. And besides that, a diesel engine is ungodly noisy unless the passenger compartment is insulated for sound deadening. You can hear them a mile away. Manufacturers would rather charge you for all the glitzy extras like GPS, a radio that you can command by speaking to it, a display screen with more on it than a 747 instrument panel. Oh! And a button to push to start and stop it is all the rage now too. All that is what sells cars now. And frankly, I’ll be glad to be free of as many diesel engines as I can. But I have one question: When did I become too lazy to open the door with a key, stick it in the ignition and twist it to start the engine? The simple automobile disappeared with the Volkswagen Beetle, never to be seen again. The good old 1953 Morris Minor two-door was pretty simple too. I bought mine from friends for £35 when they decided to emigrate to the USA. British Empire Green it was. I agree with most of your points, but people looking for a efficient auto are buying these incredible Audi turbo diesel sedans instead of a Tesla or a Prius. The transition to hybrids and EVs is not happening. That is what the greens are upset about. You should check the Audi diesel sedans. Quiet. Very fast. Clean. Get great MPG. I forgot to say thanks to Pat and TonyfromOz and Ruairi. Three updates added during the day to the post. But Jo, that’s all natural CO2 and doesn’t cause any problem. It’s the human caused stuff that’s so evil. Don’t you pay attention to all the experts? Or at least 97% of them??? I’ll give 1,000,000 bonus points to everyone who knows who said that and how long ago. In other words, the problem has been around forever. Congratulations. Add 1,000,000 bonus points to your account. You now move on to the next phase where you get to guess how much the planet cares that CO2 is around, lurking, just waiting to cause heartburn in so many people. Hint: if you guess that the planet doesn’t care at all, you will WIN. And you will double your prize if you can also answer the bonus question: why do so many people worry about nothing (have heartburn)? Sorry, no hints on the bonus question. A google search reveals reams of psychology papers on the topic of worry. As a chronic worrier I can relate to that because I worry about the consequences of not worrying about something. So the answer seems to be: worrying makes you feel better. Look at that. He wins again. Unfortunately All you get is a JND, Doctor of Jo Nova. And since you are obviously already a JND, all you need to do is pin your (now doubled) 2,000,000 bonus points to the wall under your JND certificate. A printed copy of this comment will serve to authenticate your points. Your local pharmacy can no doubt help you with heartburn. Today it may not be so impressive to stand on the shoulders of Google because they are now taking fire more than ever for distorting search results to benefit their favorite (read paying) enablers. But no matter, we had our fun and thanks again for playing along. With all the volcanic activity being discovered I have to guess that it’s been going on for a lot longer than humans have been around. Think of it, ton by ton that evil carbon is added to our atmosphere every second and somehow the planet has survived it. I have a small piece of basaltic lava picked up at a roadside rest stop that is full of little holes that once were CO2 bubbles. Volcanic activity there dates from a few million years ago; so long ago that only remnants of eruptions stick up above ground here and there; so long ago that small pieces are all that’s left to litter the ground. Where does it all go? How did we escape having a carbon dioxide atmosphere? Something must be working in our favor in spite of our nasty habit of burning hydrocarbon compounds. Or are we all dead already and just don’t know it yet? When will they learn to do simple critical thinking? Sunrise and sunset are predictable phenomena. Earthquakes ands volcanic eruptions are not as predictable, since there might be a “season” for them, within which precise prediction is impossible. Predicting a meteorite impact is also in the unpredictable category. So why the human trait of predicting the unpredictable? 54% of humanity are members of one of the Abrahamic faiths, Judaism, Christianity and Islam. Christians and Muslims all believe in an afterlife of immortality in paradise or heaven after death. So it is predicted for those of faith. Thus adherents of these faiths will have no difficulty also believing the prediction of earthquakes etc.. Though the failure of end-times predictions, or raptures might cause one to pause and wonder if earthquake predictions are ever possible. If you believe in an afterlife, is it non unreasonable to also believe in the prediction of earthquakes, volcanic eruptions and meteorite impacts? Forgive me Louis. But faith does not have to conform to the rules of statistics logic or any rules. If it did it would not be faith. So why the human trait of predicting the unpredictable? 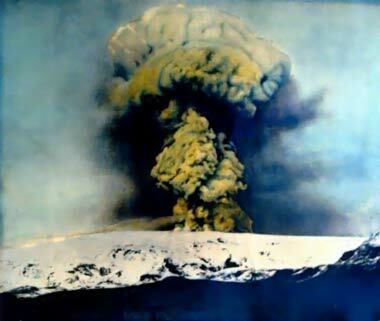 And some unpredictable events have been successfully predicted, the explosive eruption of Mt. St Helens for one. But then it cheated a little and gave some advance evidence of worse to come. Which is a wild understatement. Estimate generators utilize a few, very few, volcanic CO₂ sources. Even then, they only accept some researcher’s gross estimate. Consider Earth’s global rift system. Add in all active tectonic interfaces. Portions of which are known as the “ring of fire”. 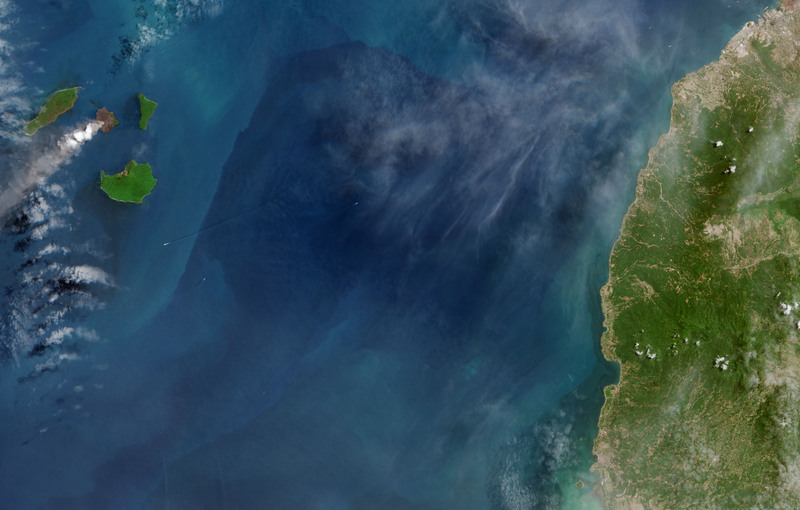 Every portion of these volcanic and tectonic active zones emit CO₂, often in large quantities. Scientists, know about and verify cases where valleys and depressions fill up with CO₂ and suffocate wildlife, including people. These locations only fill up with heavier volcanic outgasses when air movement is minimal to nonexistent. All too often, visiting researchers assume the outgassed CO₂ to be episodic origins rather than constant outgassing, with wind movement the deciding factor. Hot springs around the world are caused by underground magma sources. Hot springs are known for bubbling; i.e. bubbling CO₂ and some SO₂. Outgassing that occurs 24 hours, 7 days per week, 52 weeks per year. CO₂ outgassing evident only because it occurs through surface water. The same magmatic conditions occur over vast areas, only without surface waters to expose exiting CO₂. e.g. Geysers are known in a few locations. Some of the geysers have even been sampled for CO₂ emissions. Not only are most geysers unsampled, that the entire area around the geysers is a massive CO₂ source is ignored. These CO₂ sources are ignored, minimized, evaded, or just plain dismissed. Just as with so many numbers used for climate science; whether it is infilled, corrected, adjusted, estimated, falsely averaged or modeled, it is an empty number devoid of real world accuracy. Numbers good for a rough estimate, terrible for judging reality, deciding policy or enforcing emotionally driven choice.